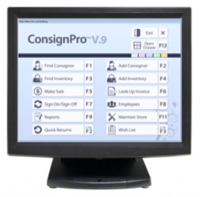 We've selected some great hardware to pair with ConsignPro. These pieces turn your Windows computer into a point-of-sale workstation and also gives you some great looking tags for your items. Explore each of these options below and then view our Package Pricing page for some bundled savings or build your custom configuration online. For information on hardware compatibility, visit our requirements page. For instructions on connecting and configuring our hardware, visit our connections page. Although we will try, our Support Team only guarantees the setup and configuration of POS hardware that was purchased directly from us. The scanning gun connects to a USB port on your computer and allows you to scan inventory barcodes into our Make Sale screen. This allows you to make sales faster, easier, and more accurately. The scanner can be used to scan barcodes produced by ConsignPro as well as manufacturer barcodes on new items that you sell. Our wireless scanning gun communicates using Bluetooth technology to a USB receiver connected to your computer. 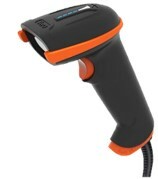 The scanning gun has a range of 10 meters and allows you to scan inventory barcodes into our Make Sale screen. Battery time is about 3 hours (rechargable via included USB cable). The scanner can be used to scan barcodes produced by ConsignPro as well as manufacturer barcodes on new items that you sell. 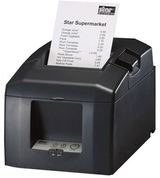 The Star thermal receipt printer produces a professional looking 3” receipt to hand to your customer when a sale is made. The printer connects via a USB cable (included) and uses thermal receipt paper you that can find in any office supply store. The printer prints with heat, meaning there is no ribbon, ink or toner to ever replace. If you’re also using our credit card processing setup, this printer also prints the credit card receipt. Our locking, steel cash drawer automatically opens when a sale is made in ConsignPro. The drawer comes with 5 money and 5 coin slots and connects directly to the Star receipt printer with a supplied cable. The drawer can also be opened manually using a key and can be placed on, or mounted below, your counter. The Zebra thermal ticket printer prints inventory tags or labels using heat – there is no ribbon, ink, or toner to every replace! The printer is fast and quiet and connects to your computer using a USB cable (included). Thermal tags and labels for this printer are available from our partner, Forms Plus, at wholesale prices! Our MagTek credit card reader is used in conjunction with XCharge to process non-EMV (chip) credit cards right from ConsignPro. The swipe can also be used to process customer Gift and/or Loyalty Cards, also built-into ConsignPro. The swipe connects via a USB port. EVM is the new chip technology that reduces the number of fraudulent credit card transactions in your shop. This VX805 device works with ConsignPro and BluePay to process credit and debit cards from our Amount Due screen. 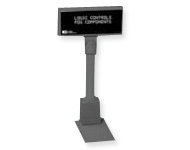 Our Logic Controls pole display allows your customer to "see" the sale as you ring up items on our Make Sale screen. This gives the customer more confidence that they are being charged correctly by you or your sales associate. 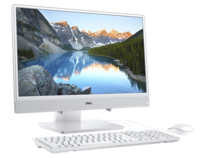 Our ELO 17” touch screen monitor reduces the need to touch your mouse. Instead, you'll use your finger on the screen as if it was the mouse! You've seen these in bars and restaurants, now they are available for resale stores too. Tap your way through a sale! Works great with laptops and desktops.